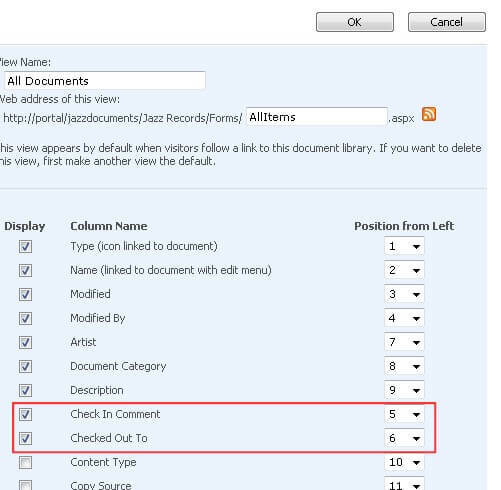 I am just getting started with SharePoint and would like to start using the Document Check-Out feature. I can't tell when documents are checked out, nor to whom. I can't even tell if the feature is on. How does the feature work? 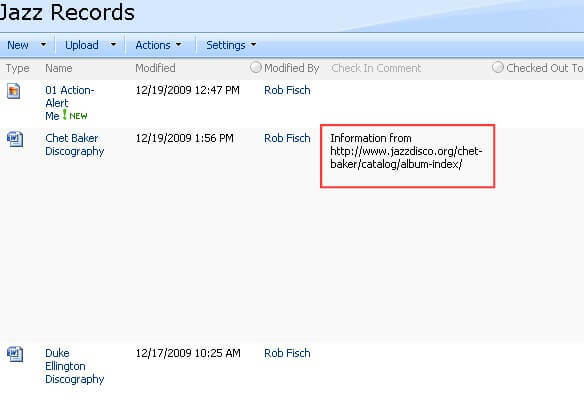 Check-Out is a critical feature for document collaboration. When multiple users are sharing and editing the same files, it is important to know when a particular document is in the process of being edited so versions do not get out of sync. 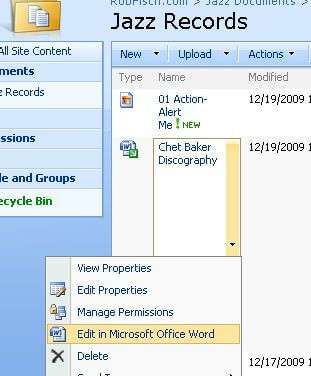 SharePoint comes with this feature, however it is not enforced by default and there is a customization to library views that must be made in order to make it visible. Additionally, there is a squirrelly behavior when using the 'local drafts' feature. This is a widely posted 'watch-out'. I'll show how to avoid the problem in a bit. 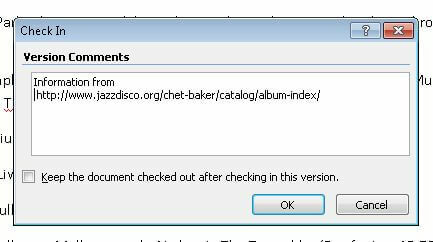 The first task is the expose some built-in Check-Out fields. In your view (i.e. 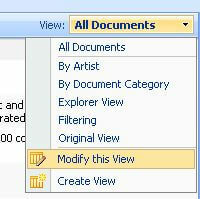 All Documents), click the View dropdown and select "Modify this View". Expose the "Check In Comment" and "Checked Out To" fields. 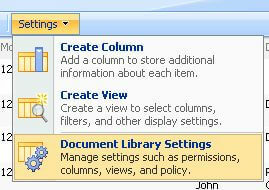 Click on the "Settings" menu of the library and choose "Document Library Settings". Change the "Require Check Out" section to "Yes". Now let's check out a document and see what happens. Hold the mouse over the document name and click the dropdown menu. 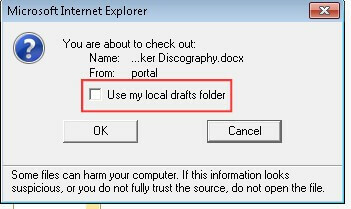 Then select "Check Out"
IMPORTANT "WATCH OUT:: By default, with Office 2007, users have the option to "Use my local drafts folder". I have seen nothing but problems with this feature. Files essentially get cached locally for offline editing. But this often causes conflicts when there are multiple users editing files. What's worse is the check box is "on" by default. I have had situations where I had to rename the file in the library in order to fix conflicts with this. Instruct your users not to use this feature! Notice the "Checked Out To" field that we exposed when we modified the All Documents view now shows who the document is checked out to. Note also the little green downward pointing arrow on the document icon. This is a visual cue that the document is checked out. 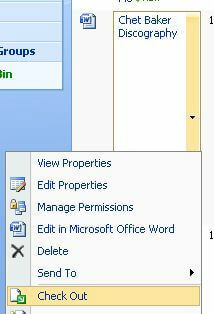 When editing Office documents, there is an option on the document name dropdown that says "Edit in Microsoft Word". Though you should be able to click on the document to open it...I've seen situations where users have issues clicking on it for editing purposes. The dropdown option works reliably. After clicking "Yes" to check the document in, you are prompted for an optional comment. The most recent check in comment is displayed in in the field.